Here is a smart sensor that helps you keep a close eye on your baby and avoid tragic accidents. 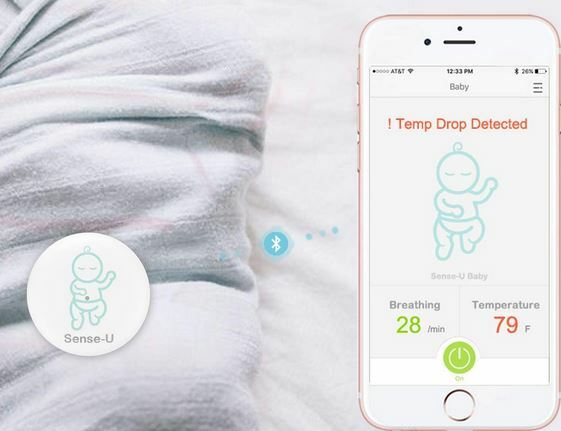 The Sense-U Baby Breathing & Movement sensor lets you monitor your baby’s sleep position and alerts you when something is wrong. It has an audible alarm for no breathing movement or fast breathing. You will be able to use this sensor to monitor temperature and humidity level around your baby. It can connect to your smartphone from up to 10 meters away. Sense-U is compact and lightweight, so it won’t make your baby uncomfortable.